I was fortunate enough to participate in a medical mission trip to Jacmel, Haiti with a non-profit organization, Community Coalition for Haiti (CCH). I went with a team comprised of 3 surgeons, 3 primary care physicians, and 1 anesthesiologist. The condition of Haiti after the earthquake was eye-opening. The streets were still filled with remnants from the quake along with destroyed buildings that were never rebuilt. The aftermath of the quake was still apparent virtually everywhere. We passed by numerous make-shift tents for Haitians that were displaced by the quake. The most astonishing site was the destroyed capitol building that still remains in the same condition since the quake. We were greeted by friendly Haitian staff at the Isaiah House that provides housing for medical teams supported by CCH. We spent five days working at the free clinic funded by CCH in the center of Jacmel. 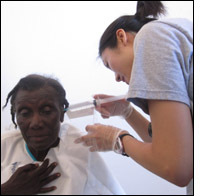 The clinic is staffed by 2 Haitian doctors and several nurses. We faced many emotional encounters and heard stories from patients affected by the earthquake that were currently dealing with PTSD, anxiety, and depression. It surprised me how vulnerable and open these patients were to share their experience of the quake and loss of their loved ones. We were able to engage in minor procedures such as amputation of an extra digit of a young, 11 year old boy. We met a young gentleman with a Stage IV ulcer of his lower extremity. The wound was infected and considering his young healthy status, we ordered an HIV test, which is the one of the few free lab tests available. He returned to the clinic on a daily basis for wound care and we changed his dressings everyday. He returned with a lab slip that stated that he was HIV positive. We were able to counsel him and provide him with services for a free HIV clinic where he would have access to antiretrovirals. Although we were faced with many difficult situations in the clinic due to limited access, we felt that we were able to provide this patient with treatment that would ultimately help save his life. Patients that presented with persistent fevers were usually treated for malaria and those with fever and abdominal pain were treated for typhoid. Due to the lack of access to diagnostic tests, we had to rely on our clinical judgement and the help of the Haitian doctors who were more accustomed to diagnosing without confirmatory lab tests. This was very different from the US where tests are readily available with easy access. My experience in Haiti truly opened my eyes to the reality of the situation after the earthquake and the limited access to resources that are so readily available in the US. Although I was only able to provide limited care in a short of period of time, it was reassuring to know that the clinic supported by CCH will continue to provide free healthcare. I definitely returned with a different outlook on primary care and now even more firmly believe that primary care can really help to save and impact lives in any area of the world.